Jarret pictured in the official Room of the Committee on Foreign Affaris and Reunification of the Korean National Assembly. 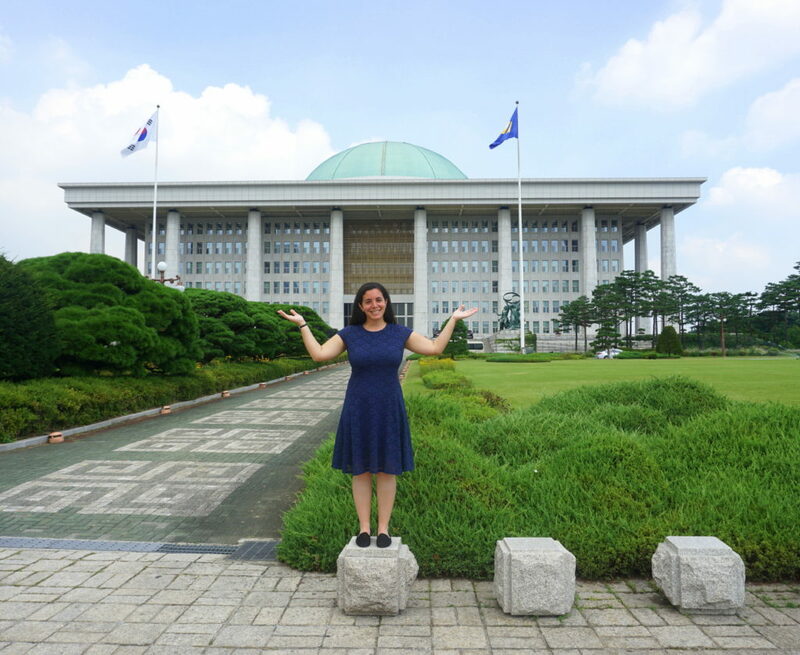 For the past 21 years, Meridian International Center has successfully implemented the U.S. Congress – Republic of Korea National Assembly Exchange, a unique program jointly funded by the U.S. Department of State and the Republic of Korea National Assembly through its Committee on Foreign Affairs and Unification. 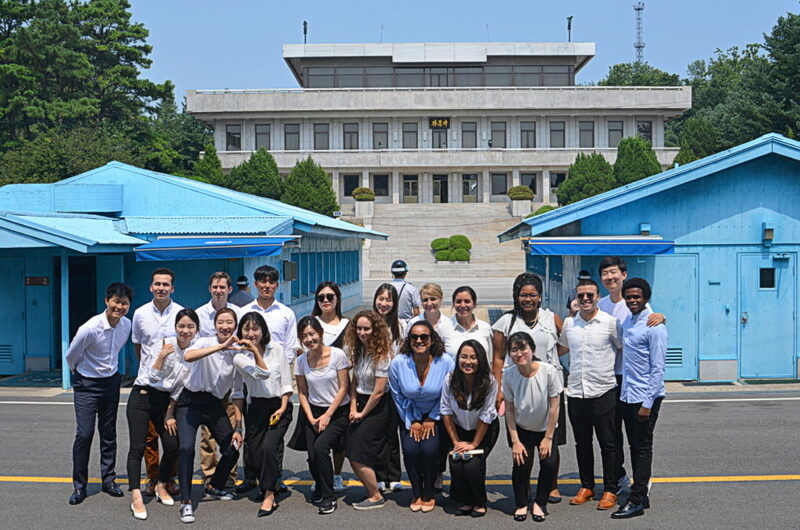 The program brings together 20 young people from the United States and the Republic of Korea for a memorable opportunity to promote cultural awareness and political understanding between the two countries. 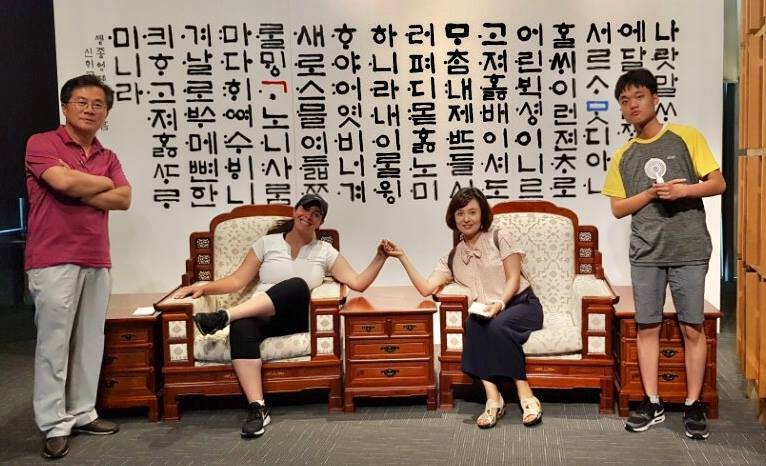 Following below is a blog by one of the U.S. participants in the program, Jarret Fisher, written at the conclusion of the program in which she shares her impressions of Korea and of the program, her experiences and the lessons learned along the way. Jarret is a native of Chicago who studied Finance and International Business during undergrad, and has also earned an M.B.A. She was nominated for this program by Senator Charles Schumer of New York. “I feel fortunate to have been chosen for the United States Congress – Republic of Korea National Assembly Exchange Program. We received unparalleled access both in Washington, DC and Seoul. The program’s in-person meetings allowed the young participants, who are certain to be our future leaders, to learn more than they ever could in a classroom. It is safe to say that the average American knows how important our military relationship with South Korea is, as did I before this program. However, that is typically the extent of one’s knowledge on South Korea. Jarret Fisher pictured in front of the Korean National Assembly Building. By physically going to South Korea, I learned, and felt, how real the threat posed by North Korea is. My feelings about denuclearization quickly evolved being just 30 miles from the border of North Korea. Coming in, I knew that although technically the Korean War never concluded, no battles had been waged since 1953. Nonetheless, if you ask a South Korean about the status, they will say that to this day they are a country at war. American and Korean participants visiting the DMZ. Pictured in the background is North Korea. Jared is fifth from the right on the second row. What I learned from the variety of ministry officials we met with while in South Korea is that the trio of North Korea, South Korea, and the United States are not the only players in the security game. There are other relationships at play. For example, I had never pondered the relationship between North Korea and China, nor South Korea and China. I (incorrectly) presumed that North Korea was a puppet state of China. China adores North Korea as a buffer state; Beijing does not want regime collapse. At the same time, China does not want a nuclear North Korea. Economically, North Korea needs China exponentially more than China needs North Korea. China accounts for 90% of North Korea’s total trade volume. Considering the above mentioned complex relationship, one could plausibly imagine China has a weak relationship with South Korea – wrong. China is South Korea’s number one trading partner. They both desire a non-nuclear North Korea, but do not agree on the method of achieving this goal. South Korea refuses to sit idly by. For example, the 2016 deployment of the Terminal High Altitude Area Defense (THAAD) at Osan Air Base angered China. Even though South Korea explained its purpose was defensive against North Korea alone, China kicked out South Korean businesses for one year. China’s proposal is “freeze for freeze.” South Korea would halt their joint military exercises with the U.S., and in return, North Korea would suspend its nuclear weapons program. 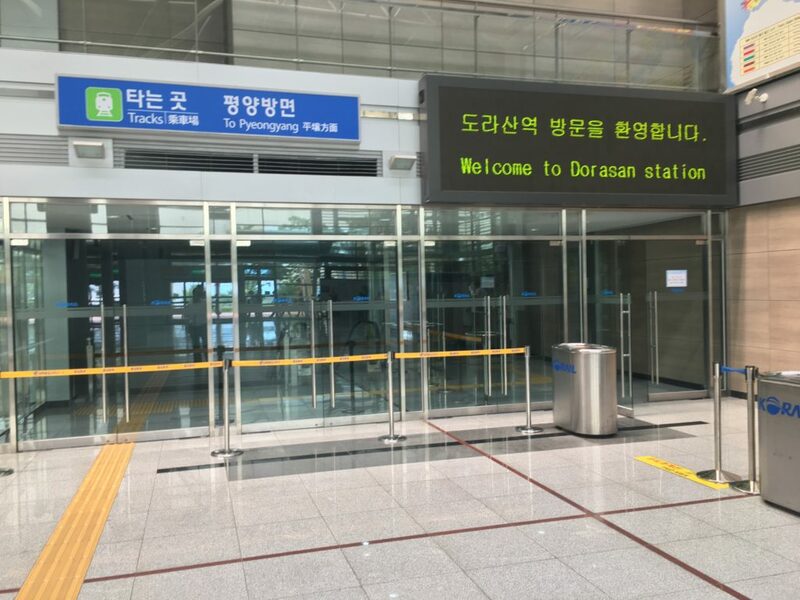 The entrance to the Dorasan Train Station, the last and most northerly train station in South Korea was used until recently to ferry the South Koreans working at the Kaesong Industrial Area. It is located approximately 710 yards (650 meters) from the southern boundary of the DMZ. During our two weeks in South Korea, we delved into the recent summits, both between North Korea and South Korea in April and May of this year, as well as the summit between the United States and North Korea in Singapore. It was a surreal experience to visit the DMZ and JSA; it was an eerie feeling to literally look into North Korean territory. It was pointed out to us where President Moon and Kim Jong Un jointly planted a tree, as well as where, in November 2017, a North Korean soldier defected right at the border. He barely survived after forty bullets were shot at him, five of which hit his body. After inserting ourselves in South Korea’s reality, I got the sense that South Koreans are cautiously optimistic regarding denuclearization, and perhaps unification far in the future. It kept coming up that there is a generational divide when it comes to the desire for unification. The older generation of South Koreans, who were alive during the Korean War, overwhelmingly support unification. 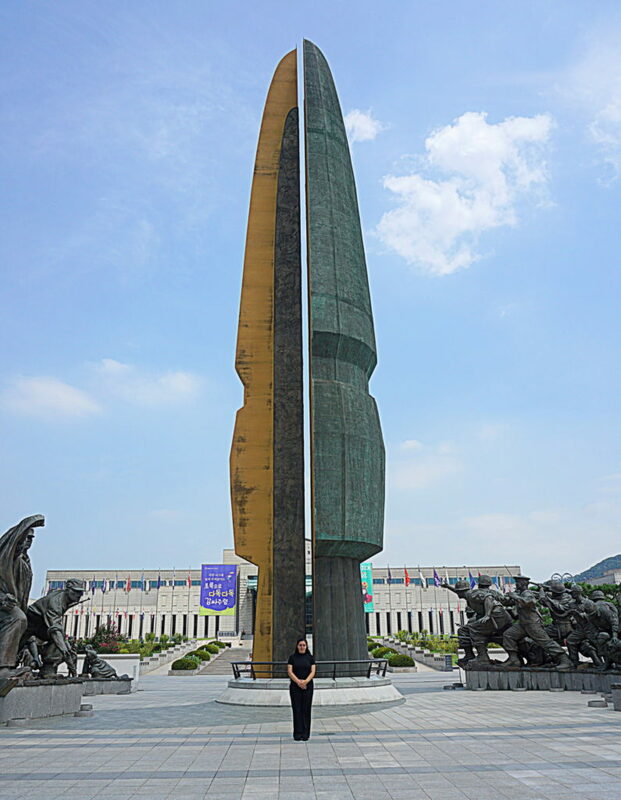 However, the younger generation, including the South Korean participants on this program, are either indifferent towards unification, or actively against it. They like how their life is right now, and how quickly South Korea’s standing on the world stage has risen. They do not want to have to absorb a maladjusted state in twenty or thirty years. After participating in this exchange program, I have no doubt that a unified Korea, operating as a representative democracy, would have an even larger economy and become an even stronger world power. Still, I do share the concern of integrating 25 million North Koreans into a vastly different way of life. South Korea already re-educates North Koreans on a smaller scale. We learned there are approximately 30,000 North Korean defectors living in South Korea today. Every single one first went through an intensive re-integration program for three months, receiving medical care, education, and job training. It is one thing to successfully resettle a few hundred North Koreans at a time, but it is another thing on an aggressively larger scale. Once unification becomes more imminent, I am curious about the contingency plans prepared by South Korea’s Ministry of Unification. South Koreans are not naive; they are aware unification is a fantasy at this point in time. All of the government ministries we met with agree that the first priority is North Korean denuclearization. On this they are optimistic too, but also circumspect, because they admit North Korea has taken no relevant steps towards disarmament. South Korea wants to get legitimate inspections going, and they want punitive sanctions if North Korea does not start making good on its promise soon. 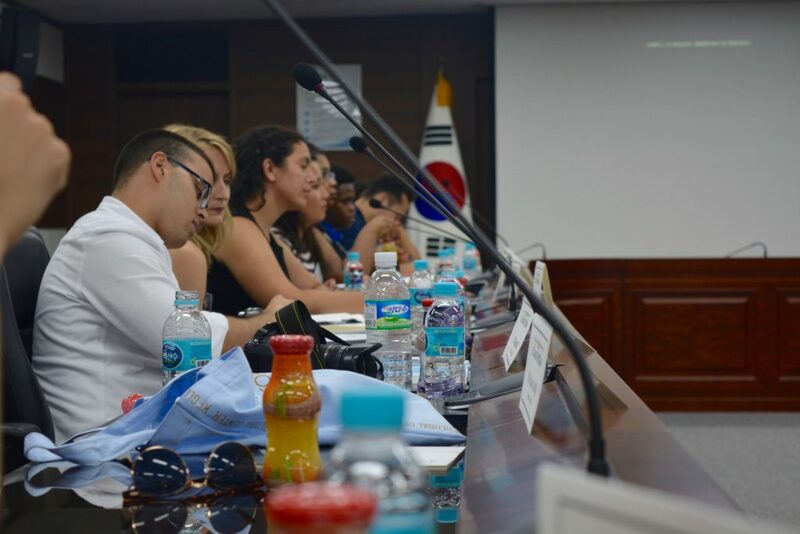 American participants attending a briefing at the Korean Ministry of Foreign Affairs. Another feature of this program that I appreciated tremendously was learning about the other aspects of the U.S. – South Korea relationship. We are economically important to one another; in 2017, South Korea was the United States’ seventh largest trading partner, while the U.S. was South Korea’s second largest trading partner. It is crazy to think about how South Korea is the same size as the state of Indiana, yet boasts the 11th largest economy in the whole world (per IMF ranking). I was pleasantly surprised to learn that South Korea and the United States are partners in bringing aid to developing countries. I thoroughly enjoyed our visit to the Korea International Cooperation Agency (KOICA) to discuss this more in-depth. KOICA is South Korea’s equivalent to USAID. I was impressed when I heard they have 44 satellite offices, and how eager they are to share their development story with currently-developing nations. After the Korean War Armistice in 1953, South Korea was left in rubble and was one of the poorest and least developed countries in the world. In the following decades, it was one of the largest receivers of foreign aid. It is inspiring how quickly South Korea went from being an aid receiver to an aid donor. 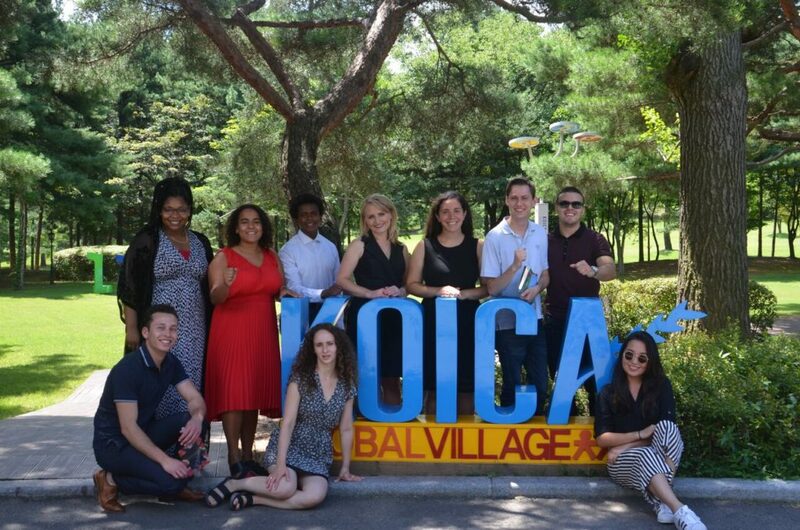 American participants pictured in front of KOICA. Jarret is the forth from the right. The United States Congress – Republic of Korea National Assembly Exchange Program is hands down the most profound experience of my life. I understand this is the one of the very few two-way exchanges for young leaders in the United States. That is a shame because the two-way exchanges make a world of a difference. Going to the country you wish to learn about is markedly more effective than reading about it; better yet is being able to share the experience with a peer in that country. The Korean participant I was paired with, Eun Won, is just two years older than me. The perspective you can get from a person so similar in age is unmatched. Being with my counterpart for three weeks allowed us to build rapport. I chatted with her every day for two weeks before the program started through KakaoTalk. By the time I greeted her in Washington, DC, we had already established trust. It was my pleasure to be her point person during her time in the U.S. I was there for her 24/7 to answer any questions she had about Congress and legislative processes. We also talked a lot about American culture, especially about sports, music, and food. She knew she could ask me anything at all, and I knew I could ask her the same. On my journey of learning about her home country, it was invaluable to hear Eun Won’s perspective and unfettered opinions. 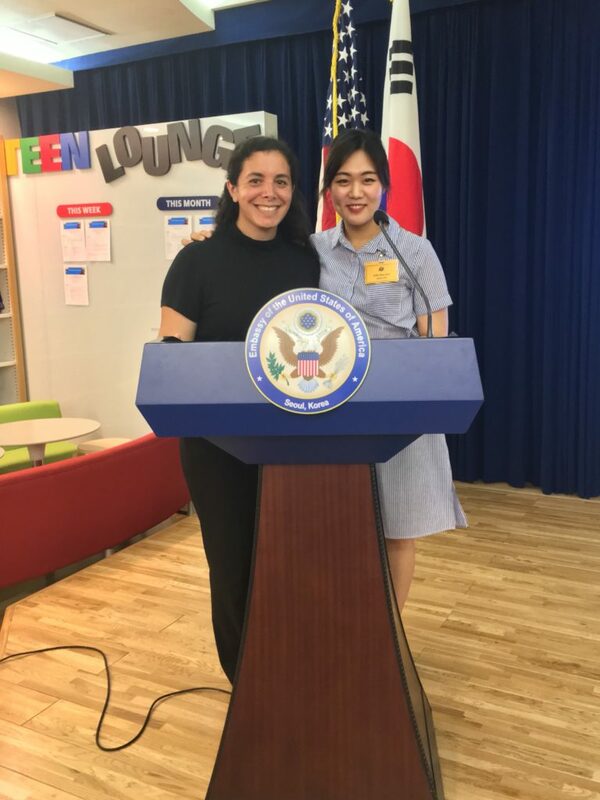 Jarret pictured here with her Korean counterpart Eun Won (Kalsey) at the U.S. Embassy in Seoul. The icing on the cake was spending one of our weekends in Korea with Eun Won’s family. She has a younger sister, a younger brother, mom, and dad. Her younger sister was studying abroad in Europe, but I had an enjoyable time with the rest of her family. When they came to pick me up for the homestay, it was as if they had known me since I was born. They were so welcoming, and I am confident I will maintain a relationship with Eun Won and her family for the rest of my life. Those two days with Eun Won’s family made me feel at home in Korea, and because of them, I left with an even stronger fondness for Korea. Jarret pictured here with the family of her Korean counterpart, Eun Won. Jarret spent a weekend home-stay with the family during the program. I cannot say enough thank you’s! Thank you to Congress and the Republic of Korea National Assembly for being the sponsors of this exchange program. In the U.S., thank you to the State Department’s Bureau of Educational and Cultural Affairs. Thank you to Meridian International Center for the laborious planning and implementation of the program. Thank you to Sarah Yagoda, Harrison Davis, Bogdan Banu, and their two interns – Jacqueline and Tim. Thank you to our bus driver Mazen. Thank you to all of the organizations and individuals who took time out of their busy schedules to meet with us in Washington, DC. As for South Korea, thank you to the National Assembly’s Foreign Affairs and Unification Committee for funding the portion of the program in Seoul. Thank you to Mr. Kim and the Committee’s intern, Irene, who doubled as a world-class translator. Thank you again to Bogdan Banu for traveling with the Americans to Korea. Thank you to all of the ministries and officials who met with us in Korea. Thank you to the Embassy of the United States in Seoul for hosting a reception for us. Jarret and Irene at Gwanghwamun Plaza in downtown Seoul. Thank you to my roommate, Katelyn, for making this experience even more memorable. Thank you to my Korean counterpart, Eun Won, also known as Kalsey. 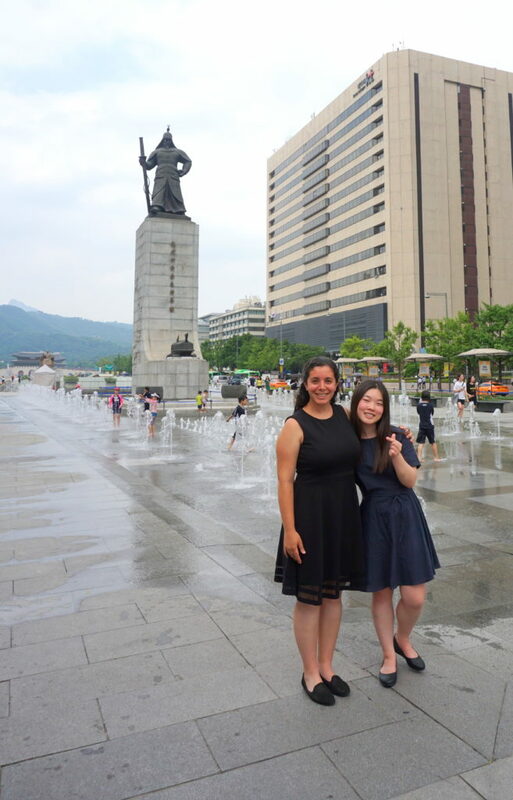 I learned a hundred times more about Korea from her than I could have otherwise. Thank you to the rest of the Korean delegation; I am thankful to have met them all. They are intelligent, capable young leaders who are quick learners and great teachers. Thank you to the rest of the American delegation. The same thing I said about the Koreans applies to them! I look forward to seeing where everyone ends up, both professionally and personally, in a few decades from now. There is no doubt I had the pleasure of rubbing elbows with future Congressmen and women, and National Assembly members. 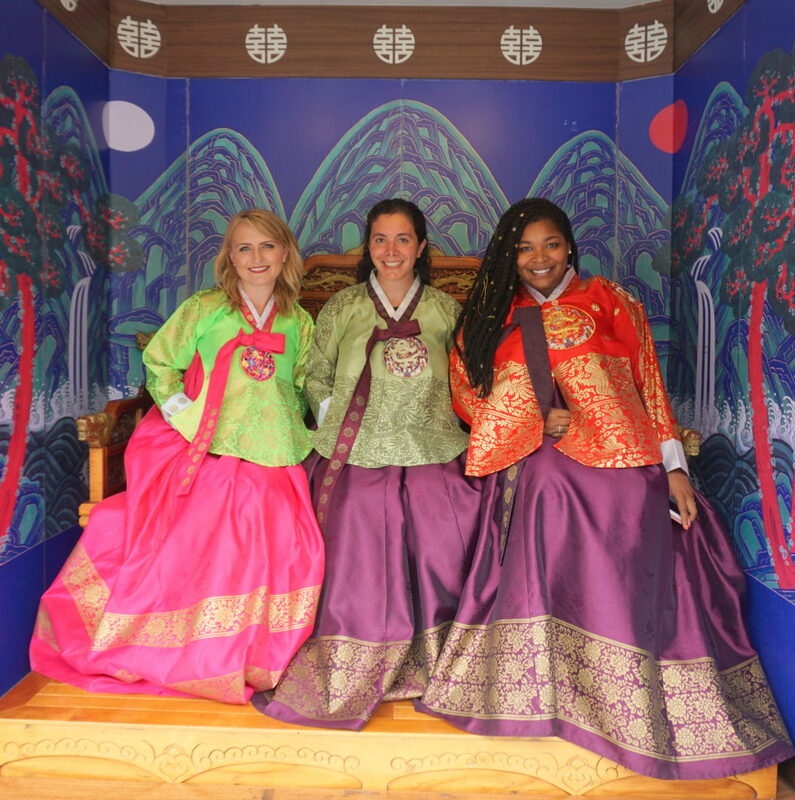 Jarret, her roomate Katelyn and Nasya pictured here in traditional Korean outfits. This is a vital program that makes a difference on a personal and national level. Without the funding for this exchange, I would never have been able to travel to South Korea and engage with issues pertaining to our important relationship with South Korea. I come from a single-parent, low-income household. I am thankful that my government invests in the voice of all future leaders, regardless of race, ethnicity, gender, sexuality, religion, ability, geographic area, socioeconomic status, and political leaning. I promise that the cost of this program is a small price to pay to cultivate the next generation of American leadership. All ten American participants forged deep relationships with our Korean counterparts, ones that will be long lasting and mutually beneficial. You cannot grasp the full reality of a country and its foreign relations until you set foot on their soil. Citizen-to-citizen diplomacy cannot be commended enough for its contribution to the prosperity of the United States. POST TAGS: Capitol Hill, Exchange, Global Leaders, International Exchange, Korea, Meridian Impact, South Korea, U.S. Department of State.